Summary : A nice way to break the monotony of drinking straight green tea, as this one has a little "splash" of vanilla in it. Review : I like Green Tea. And I love Vanilla. So....I had every reason to hope, perhaps beyond hope, that the Vanilla Green Tea put out by Culinary Teas would fast become my favorite tea in the cupboard. 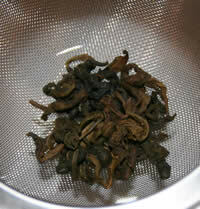 As such, when I tried my first cup of this tea, I really, really had high expectations for this particular tea. Perhaps because of these high expectations, I was a bit disappointed. Now, I'm not saying the tea is bad. Far from it. Instead, I guess I just built up some unreasonable expectations about what this tea could deliver - thinking it would deliver me into some paradise where the taste of Vanilla Ice Cream dominated the culinary menu. I was sort of hoping that this tea might somehow be a combination of Vanilla Ice Cream and Green Tea. But alas, it was not to be. Instead, it just showed me the futility of positive expectation for a tea you never have tried before! Now, the tea had a great aroma straight out of the lightproof, air-tight bag that Culinary Teas packs their samples in. The tea had, not surprisingly, an intriguing aroma of both green tea with a strong hint of vanilla. And the leaves, wow, talk about huge! These leaves were so big you could use them as a flotation device in an emergency. So, happily, no worries here about the leaves slipping through the colander during brewing. The taste of the tea I would rate as, well, average. I found this Vanilla Green Tea to be a bit on the weak side. Granted, green tea isn't really known as a "strong tea", but the flavor in this particular variety really wasn't anything more robust than your standard green tea. About the only difference is that the tea did have a light to moderate taste of vanilla in it. I wouldn't call it a real strong vanilla flavor, though, which dejected me since I really love Vanilla! Overall, anyone who enjoys standard green tea will like this tea too. All it is is green tea with a side taste of vanilla in it. For those looking for a strong tea, however, look elsewhere. Recommendation : A nice diversion from drinking straight green tea. Not as strong in the "vanilla" category as I would like, but you can't have everything. Brewing Instructions : Use 1 teaspoon of tea leaves. Note, since the leaves are so big, you'll need to use about 1.5 teaspoons. Pour one cup (6 ounces) water that is 180 degrees over the tea. Let brew for 2-3 minutes.